Waking up in our jungle cabana to the sound of howler monkeys all around us was just magical! When we decided to visit Palenque ruins we had a choice of staying in Palenque town or in the jungle, hippy hangout area of El Panchan. We were certainly glad that we went for the latter! 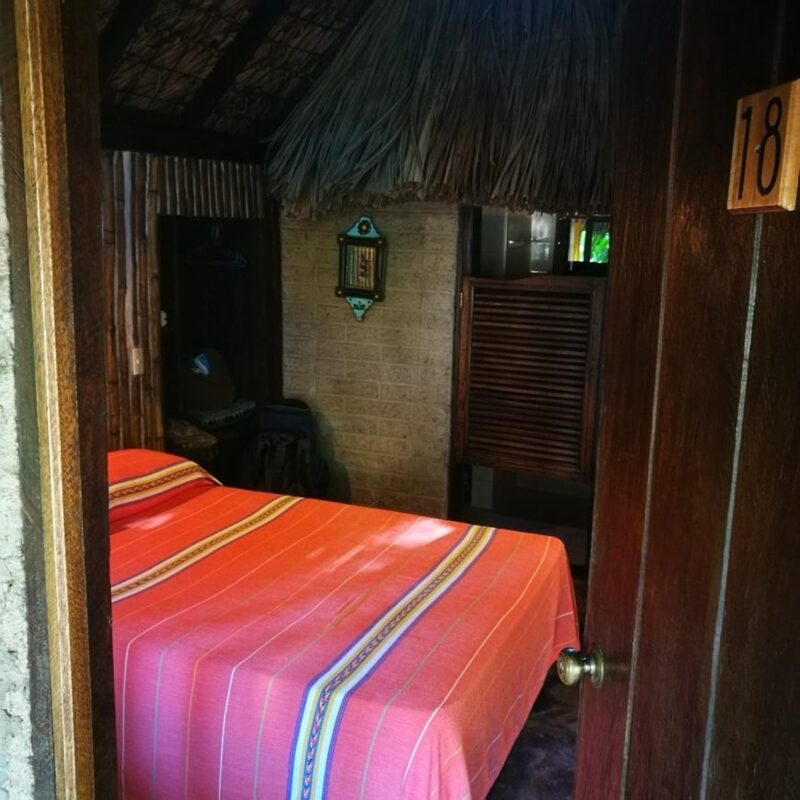 After researching hotels near Palenque ruins a little we decided to go for the cabanas that were closest to the ruins & we were not disappointed! The setting of the place was just amazing! We had a cute little cabana, equipped with everything we needed & great facilities on site, it really was quite special. We discovered when we were there that you can also rent hammocks & pitches to camp right in the jungle for about quarter of the price of a Cabana, something which had we known we definitely would have done. Taking your own tent is also an option. We spent the first day at Mayabell Palenque just lazing around the jungle side pool & by the afternoon were adopted by a Mexican family of around 20, we had a great evening & drank copious amounts of tequila! A little tip, never tell a Mexican you do not really like tequila, that night turned out to be a bit of a blur! You can check out their website here. 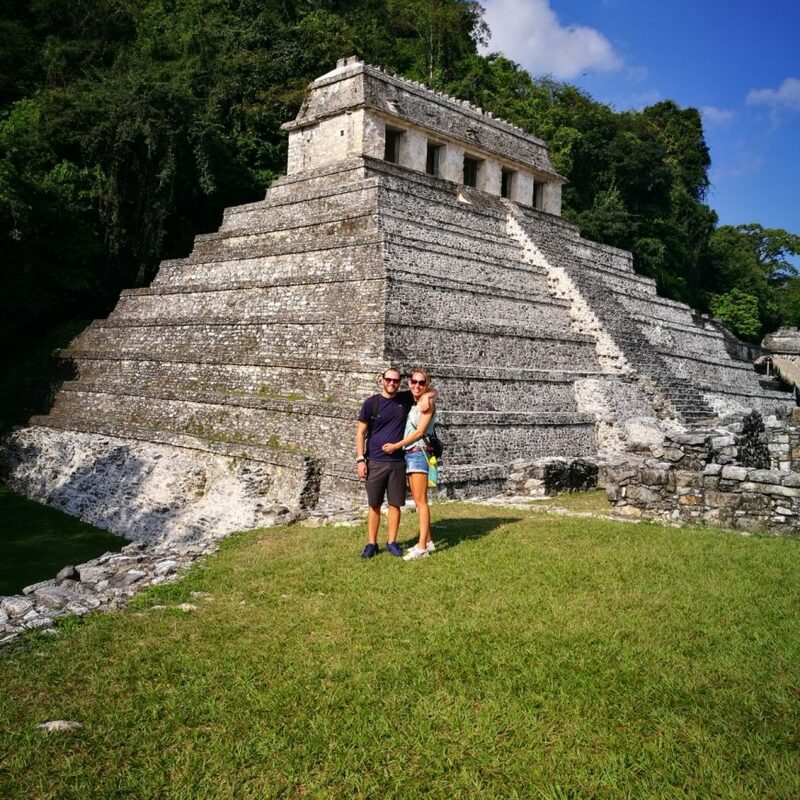 We loved Mayabell Palenque and would highly recommend staying here! 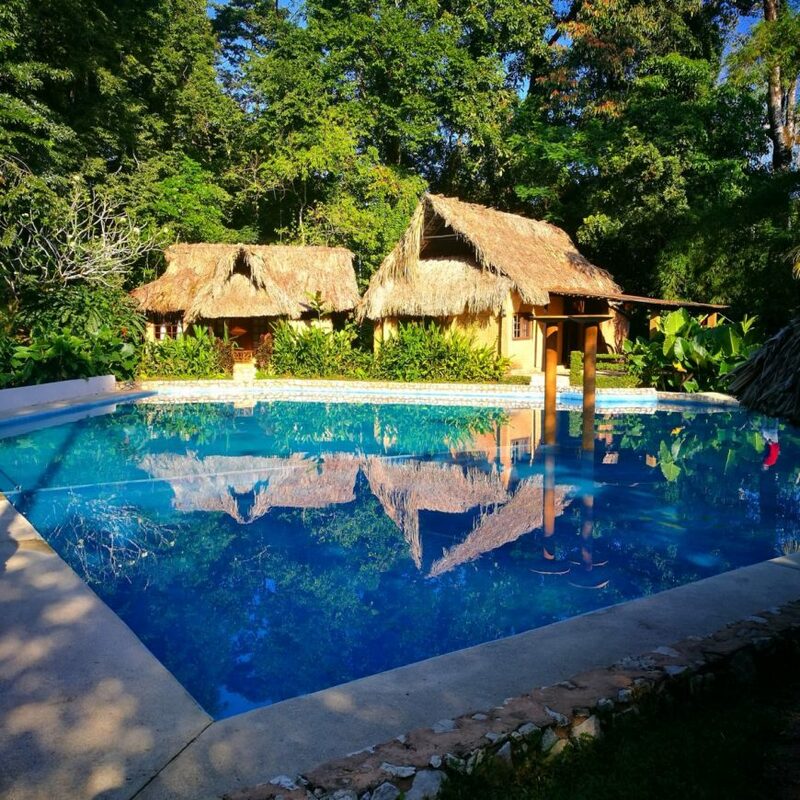 There is also some other really great options for places to stay in Palenque here. With a slight tequila hangover we dragged ourselves out of bed ready to get to the ruins for opening at 8am. Arriving this early meant that we were one of the first in & our first glimpse of the ruins were just…. wow! These huge structures, sat there so peaceful against the jungle backdrop were really something else! We took a good 30 mins just to walk around & soak it all up, no photos just taking it in. We both agreed that it was one of the most spectacular sights we had ever laid eyes on. 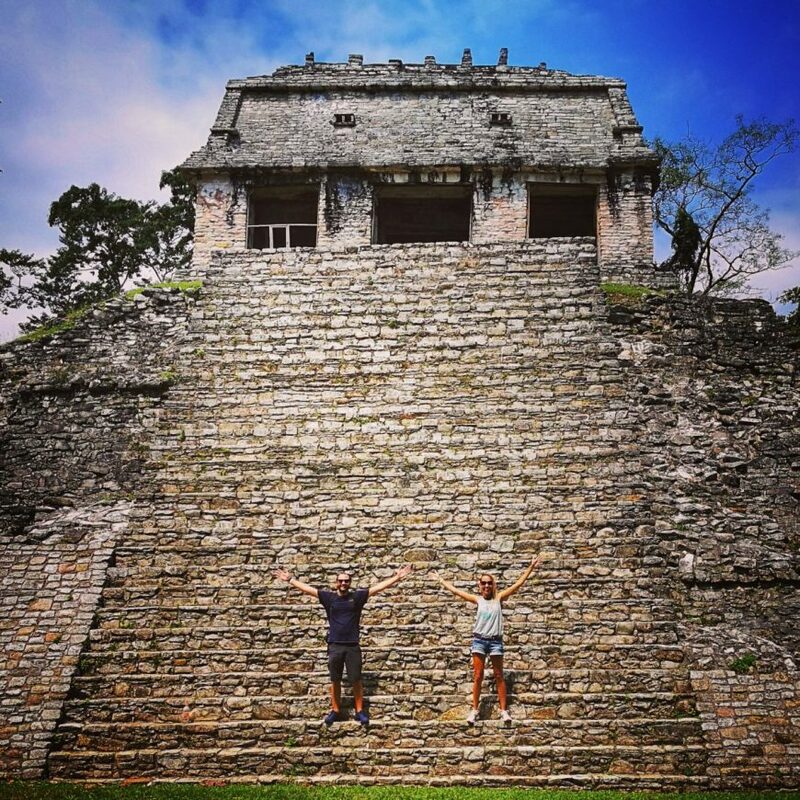 We spent around 4 hours there, with howler monkeys crying out from the surrounding jungle we were really able to feel at the ruins of Palenque what it would have been like as a Mayan resident, more so than any of the other ruins we visited. This was why they were our favourite, it was as though they managed to transport us back in time! Once the crowds came, it made them not so magical & was time for us to leave. Our advice – get there early! Get around the ruins before anyone else does then make a trip back round to read up on them, or better still find the shade of a tree & read from your guidebook. Enter the ruins from the main entrance to view the main structures before the crowds then head down to the jungle area & Grupo de los Murcielagos & exit the ruins here. We came across Don Muchos when we arrived in Palenque very early morning & were after a spot for breakfast. Set again right in the jungle, a pretty big but chilled dining area, we loved it! So much so we went back for lunch & dinner in the 2 nights we stayed in the area. The evening time was super busy but with live music & a very reasonably priced menu with good Italian food & some Mexican options we could see why. It had a great vibe & candle light & was just a 10 minute walk for us from Mayabell Palenque. If you are coming here from Palenque town it’s a 10 minute taxi to El Panchan. Getting to El Panchan: From Palenque town or the main bus station it cost us 70 pesos & was just a 10 min journey. Entrance fee for the ruins: A bargain at only 50 MX pesos! 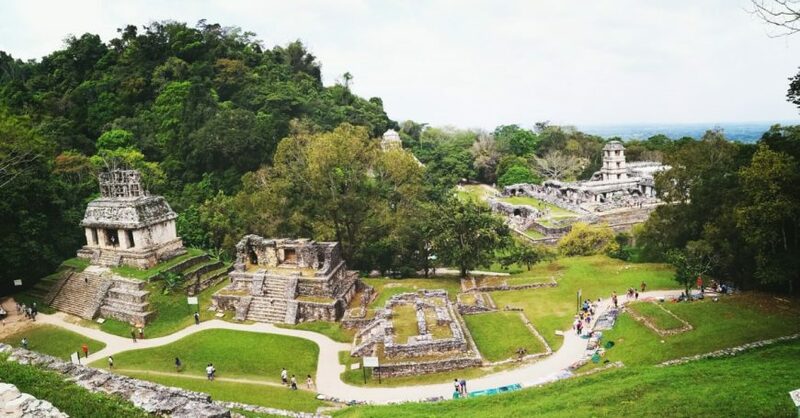 Other Palenque Tips: The entrance to El Panchan is also the entrance to the national park, meaning you have to pay a 30 MX Peso entrance fee if you enter between 7am & 8pm. Once you pay these fee you are issued with a band so you only have to pay it once. This entry was posted in Mexico and tagged Palenque. Awesome places! I’d like to visit all of them! All of the Mayan ruins we visited were impressive but these just had an added kind of magic to them with all of the surrounding jungle & howler monkeys ??? ?